The autumn fry bashing is in full swing here at Esthwaite and although the Trout fishing has been challenging of late, there has been a few good reports. Peter Stone,, a visiting angler from London fished from the boats with a sinking line and Cats Whisker combo’ to record 3 nice Trout to 2lb. Ian Farrell from Widnes also employed similar tactics from the boats , using Zonker and Sparkler patterns on a Di-3 line. He landed 2 nice fish about 1lb 8oz each. John Peacock from Preston fished legered worm from the boathouse banking on the Eastern bank and landed 4 fish about a pound each. Meanwhile James Dean from Kendal fished mini Rapalas and tempted 3 Trout to 2lb 8oz. However best reported Trout of late was taken by Dave Ainsworth who fished a 7 gram Toby from the boats. He landed a beautifully conditioned grown on fish of 3lb+. Prospects for the forthcoming weeks look very good as long as the weather holds, but it is a reminder to all, that the Brown Trout have to be released when caught until 15th March! Well what can I say but “wow”, what a start to the Pike season we have had this year. There have been numerous reports of doubles and 20lb+ specimens since we opened on 1st October. Pike have been coming out left , right and centre. From the bank as well as the boats and on a variety of methods, including lures and deadbaits, both static and trolled. Paul Brindle from Ramsbottom fished from the boats and landed a 20lb 13oz Pike on the fly, with a few back up fish too. Drew Mcwilliam from Barrow has visited the fishery a couple of times and fished trolled deadbaits from the boats and has reported fish of 14, 18 and 25lb respectively. Also from Barrow and fishing from the boats, Mark Carding and Jack Harris have reported fish of 13, 14, 2x 15, 18 and a 20lb’er on lures and static deads. Season ticket angler Ian Driscoll from Wigan has reported fish of 12, 15, 16 and 22lb from both boat and bank ( see attached photo). Another season ticket holder Martin Broadhurst has reported numerous fish to 18lb. Geoff Birtwistle has reported fish to 18lb on static Mackerel baits. Mark Billington has reported plenty of action too with fish to 17lb. Patrick Milby from Ulverston fished the car park peg from the bank and landed a cracker at 21lb 2oz on Pollan. John Whittal reported fish on lures and deads to 20lb+ and Delwyn Hobbs from Liverpool fished deads off the car park to take a magnificent 21lb’er (see attached photo). There’s also been many, many more! 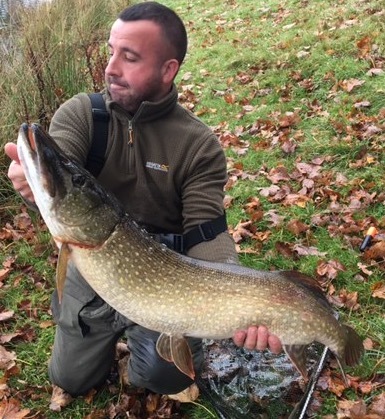 For those that are daunted by large stillwaters or who are new to Pike fishing, we offer a top class guiding service with 30 years experience on Esthwaite Water. We have been very busy on the guiding front since the start of October with plenty of satisfied customers landing the fish of their dreams and only one blank day since the start of the season. To find out more about the guiding service please contact Dave on 015394 36541. The general Coarse fishing has continued to be excellent with plenty of quality bags of Roach, Rudd, Bream, hybrids and Perch reported on feeder and sliding waggler tactics. Don’t forget folks we are open year round now for the Coarse fishing. Day tickets cost just £10 and the use of Groundbait and maggots are permitted. The boathouse stretch on the Eastern bank has been in good form. Also the banking opposite the ticket office as well as the car park pegs have been throwing up consistent sport. From the boats, anglers have been doing brilliantly with the slider and dropshotting for the Perch has been red hot with fish to 2lb+ reported. Esthwaite is growing in popularity for the Coarse fishing and is becoming “The” place to visit in the North of England. So for all those Coarse fishing fanatics out there, no more travelling to Loch Ken. Its right here at Esthwaite in the heart of the Lake District! For up to date information please telephone or email the fishery. Also feel free to keep up with daily reports on Facebook, Twitter and Google+. Tightlines!